When it's too hot in the desert, the smart riding is along the coast and into the coastal mountains of Southern California. Starting in San Diego, we'll ride to Crestline/Lake Gregory, high in the San Bernardino Mountains. From there, we'll find our way around (NOT through) Los Angeles then ride the scenic California coast on famous Highway 1 to San Francisco. Along the way, we'll overnight in Venice Beach, Santa Barbara, Cambria and Monterey. If you only have 7 days, this is a once-in-a-lifetime must-do ride! At this point, you can drop off your Harley and head for home. OR  if you have more time, do the roundtrip ride: After a layover day in San Francisco, we'll start a 5-day ride from San Francisco to San Diego that follows an inland route through the coastal mountains with hundreds of miles (smiles?) of great back-road riding. This part of the tour includes overnight stops in San Juan Bautista, Paso Robles, Ojai and Big Bear Lake before finally returning to San Diego. In total, this tour combines 1,800 miles of scenic and fun roads. We start our adventure by exploring some of the San Diego County back-roads as we ride through Pauma Valley on our way to lunch in Old Town Temecula. After lunch, we'll stop at Diamond Valley Lake and Oak Glen before climbing more than 6000 feet [1800 meters] into the San Bernardino Mountains to the mountain resort of Lake Gregory/Crestline. We ride past Lake Gregory and Silverwood Lake before crossing the Cajon Junction on our way through the San Gabriel Mountains. From the town of Wrightwood, we follow the beautiful Angeles Crest Highway to Tujunga Canyon. From here, we drop into the San Fernando Valley before riding famous Topanga Canyon to the Pacific Ocean near Santa Monica. Venice Beach is just a short cruise south. We follow the Pacific Coast Highway north through Malibu and Ventura on our way to Santa Barbara. This is a great day to cruise the beaches, or for those who want more "twisties", we can ride Mulholland Highway in the nearby coastal foothills. We may take the route through Ojai and a ride around beautiful Lake Casitas then through Montecito before arriving at our motel near the beach in Santa Barbara. We ride through the Los Padres National Forest in the coastal mountains and stop in the Danish village of Solvang. We'll skirt around Vanderberg AFB before our lunch stop at the Far Western Tavern. After lunch, we'll return to the coast near Pismo Beach and take a break in Morrow Bay before continuing to the small town of Cambria on Highway 1. Time to explore the beautiful inland valleys, go wine tasting in nearby Paso Robles or take a tour of the fabulous Hearst Castle. 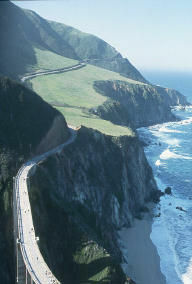 Ride the most famous part of Highway 1 through Big Sur and Carmel. From here, it's only a short ride to Monterey. We'll follow Highway 1 around Monterey Bay to Santa Cruz, then continue along the coast to the city by the bay, San Francisco. We'll cross the Golden Gate Bridge for a scenic view of the City before riding the final leg to our hotel in the famous Fisherman's Wharf area. For those riders doing the 7-day tour, this is the end of the line. You can head for home, stay in San Francisco or continue your journey on your own - you decide. A chance to rest, relax, and maybe do a bit of sightseeing in one of the great cities of the world. We'll ride through the fabulous Santa Cruz mountains in the San Francisco peninsula between the beach and the bay before turning inland. There are plenty of back-roads to explore on our way to San Juan Bautista and Hollister, birthplace of the American "biker". Highway 25 south from Hollister is a terrific ride along the spine of the Diablo Mountains. We cross the mountains once on a side-trip to Coalinga and again on our way to Paso Robles. There isn't a freeway anywhere. We ride the beautiful rolling hills east of Paso Robles before crossing the Temblor Range and dropping into the western part of the San Joaquin Valley near the historic oil well towns of McKittrick and Taft. 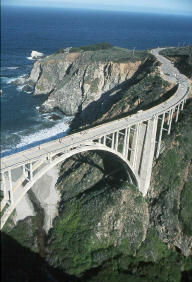 From here we'll ride the scenic and entertaining roads through the Los Padres National Forest before arriving in Ojai. Ojai is a small town nestled in the foothills above Santa Barbara and home to many of Hollywood's rich and famous. We'll head east to Canyon Country and Bouquet Canyon before crossing the high desert near Palmdale. From here, we'll find our way into the San Gabriel and San Bernadino Mountains before ending our day in the quaint mountain town of Big Bear Lake. All good things must come to an end, but not before one last day of great riding. There are plenty more mountain roads before we stop for lunch in the historic mining town of Julian. From here there are even more scenic and challenging roads as we find our way back to our starting point in San Diego. Wow, what a great ride!